Jacob Fairfax could not be slowed down, scoring 8 goals for the Raleigh Flyers in Week 1 of 2018. It was the second most goals Fairfax has scored in a single game in his career. The Raleigh Flyers with the exclamation point on opening night! 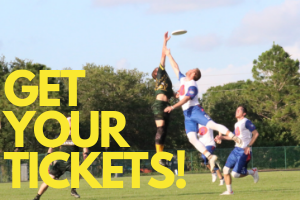 Tampa Bay Cannons are a professional ultimate frisbee team in the AUDL South Division. We are excited to bring the best ultimate to the state of Florida.